Everyone wants to play D1 baseball; only 1% of high school players will go on to play at D1 programs. Want to be part of that 1%? Below are five things that we have indicated as current D1 baseball players that can set you apart from the pack. Everybody knows that kid growing up who slams his helmet when he gets out and no matter how the team is doing he is upset if he isn’t playing well. This type of selfishness doesn’t work at the Division 1 level. Besides your parents and some of your close friends, no one is concerned with the type of game you have, scouts and D1 coaches want winners that stay even keel no matter the situation. I’ve seen guys who were drafted lower then they were projected or not get drafted at all because they can’t keep their composure when it hits the fan. In D1 baseball you will fail and coaches and recruiters will know that. So if you want to play at that level, you have to figure out how to be that guy that doesn’t let things spiral out of control after an 0-4 game. Be a gamer and try to be the same guy day in and day out. In Junior College, I was putting up ridiculous numbers. When I would ask the scouts what I was doing wrong and why I hadn’t been drafted, they all said that I needed to put on 20-25 pounds. Size not only tells D1 and pro scouts that you are strong, but it also tells them that you will be durable down the stretch. Don’t let size be the reason you don’t go D1. Don’t say “I can’t put on weight,” I don’t know how many guys (including myself) that said that over their career but are now 200 pounds. Watch the D1 players on TV, if they are 20-30 pounds heavier than you then you need to step up physically and it can be done. Obviously, this will vary depending on your height, but this is a general weight and body fat percentage that D1 players play at for each position. If you are reading this article, then you have expectations of playing D1 baseball. If you think that you can get to that level, then you are doing something right. You are probably playing well and are one of the best guys on your high school or club team. To play at the D1 level you will have to play to your strengths. Be realistic about the type of player you are and don’t deviate from your strengths. Think about what your strengths and your weaknesses are; play to your strengths and hide your weaknesses. If your a guy who can really run then work at-bats, get on base and steal bags. Also, teach yourself to bunt. D1 coaches love a fast guy that can drag; it will boost your average. If you are a power guy, look to strike out less and get your pitch. When you get it, let it eat. If you are good with the glove, don’t big league your ground balls between innings. D1 coaches are always watching and that could be your one chance to show how good you are with the glove. This is one of the best ways to develop what we call in D1 baseball “feel.” You can learn a lot from watching baseball. Find your guy on YouTube that is at your position or is a similar hitter as your and model your game after them. Watch your teammates at-bats and learn what the pitcher is doing; pick up patterns. Guys think they have four at-bats per game, but they actually 30+ at-bats if they are watching while their buddies are hitting. You can learn a lot from watching the guys in front of you and finding tendencies. If you can pick up on pitchers tendencies you will steal more bags, you’ll put up better numbers at the plate, and you will stay locked in while other guys are losing focus and giving away at-bats. The best way to make good friends in baseball is being a good teammate. Surrounding yourself with good friends that share the same passion for the game will help you through the ups and downs of baseball. Have a good lifting partner that will encourage you to get better and stronger in the weight room. Have a buddy you can go and hit with if you want to work on your swing. Have a good throwing partner that takes a simple thing such as playing catch seriously. If you are reading this article you are likely a in the top of your lineup. Surround yourself with the guys hitting around; this will keep you comfortable during games. Develop accountability partners that will keep you from spiraling out of control. Surrounding yourself with good people is the best way to better yourself while still having fun at the yard. It won’t be the hits or the home runs that you remember, it will be the people and the relationships you made along the way. Though this blog was beneficial? please share on FB and like us on FB & Instagram! Have a younger brother or son ages 6-12? Check out our Youth Baseball Camps! Why do we do what we do? 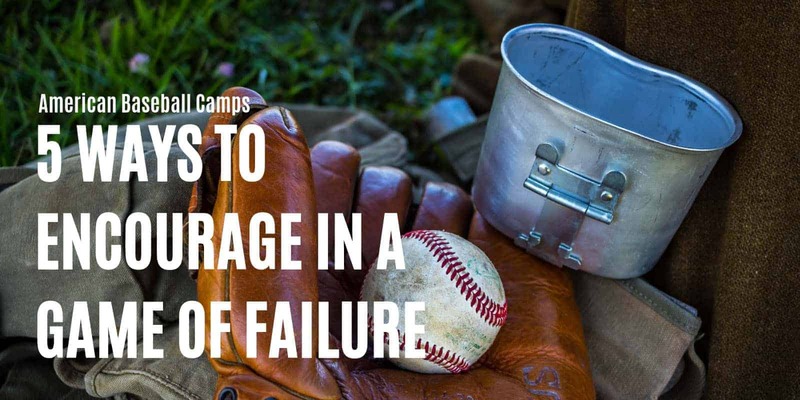 With 72% of youth baseball players quitting by age 13 – American Baseball Camps came on to the scene in 2015 to help young players fall in love with the game and to “get better & gain confidence.” We do this with baseball camps all over the US including but not limited to: baseball camps in Benbrook Texas, baseball camps in Oklahoma City/Choctaw Oklahoma, baseball camps in Citrus Heights California, baseball camps in Hackensack New Jersey, baseball camps in Kansas City Missouri, baseball camps in Kissimmee Florida, baseball camps in Norton Massachusetts, baseball camps in Peachtree City Georgia, baseball camps in St Louis Missouri, baseball camps in Topeka Kansas, baseball camps in Tulsa Oklahoma, baseball camps in West Covina California, baseball camps in Wichita Kansas, baseball camps in Phoenix Arizona, baseball camps in Milwaukee Wisconsin, baseball camps in Columbia South Carolina. From weighted balls to exit velocity, everyone has their gimmick that will get your son to the next level. 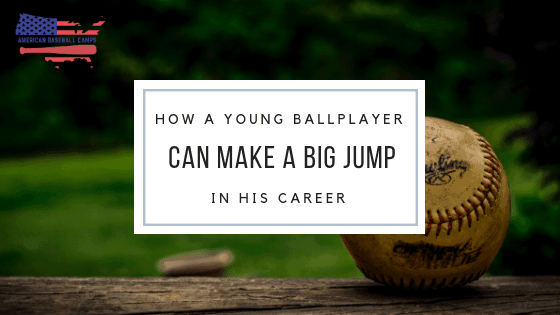 But they are missing something, an “X-Factor” that current MLB players are recommending as the difference maker in a young ballplayer’s journey to Big League Fame. A quick backstory. My name is Nick Rotola, I founded American Baseball Camps at age 22 and had to proxy business ownership to my brother because running a baseball camp company while playing Division 1 Baseball is “deemed illegal by the NCAA.” –> Trust me those guys are a little much but that’s a conversation for another day. The Sports & Fitness Industry Association releases a report every year showing the rise or decline of participation in each youth sport. Here’s the link to their report but you should know that it costs $600 to purchase so #buyerbeware. 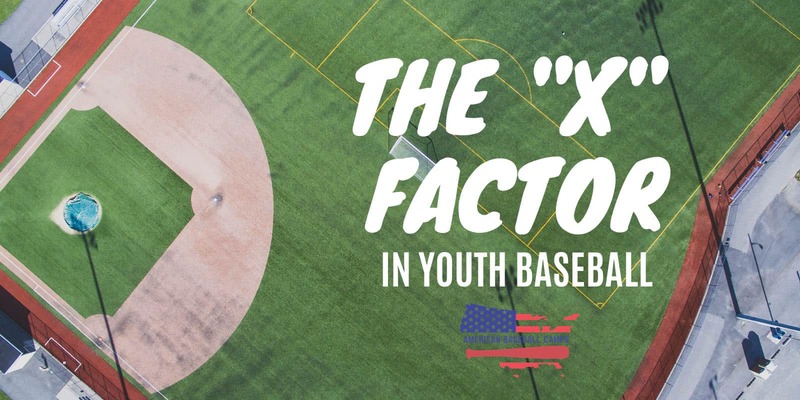 What they found is that Baseball & Softball participation is on a rapid rise due to its popularity within the parents that are as conscious about their children’s health and well-being as any generation of parents to date. Many parents have their kid in baseball because they feel their use of technology needs to be mitigated, while others are in baseball because its a non-contact sport and concussions are really starting to scare people. (Not to say you can’t get concussions in Baseball). But, as someone that’s recently been to the next level – and as a ballplayer that has “actually read a book once” as Bull Durham depicts – I feel that I may have some insights that could save a lot of Ballplayer Parents a lot of time and money over the duration of their kid’s career. Every parent should understand this one because it is the case in every single profession in the world, it takes repetition to become an expert. In fact, it takes a person 30,000 hours of doing something to be considered an “expert” in their field. This lines up nicely with the 27-30-year-old “prime” that they tag on ballplayers. With this in mind, we learn two things for your young ballplayer. The first is that the more he plays the better he will become. It’s not saying that he’ll get better from a benchmarking perspective so don’t go comparing your son to the coaches’ son Shortstop just yet. It means that every time he puts on his cleats, in theory, he’ll be a better ballplayer than the time before. The second thing we learn from the expert analogy is that your son won’t be in his prime for a long time. Stop fussing if he went 1 for 4 and he should have went 2 for 4, its baseball, you have to be process oriented not results oriented. Limit Screentime. Kids are on their screens an average of 6.5 hours per day, time that does almost nothing for them in their baseball career, and probably pumps enough endorphins in their bodies that they have a tough time appreciating and loving the game of baseball like they could. Set Goals. It wasn’t until I saw a Division 1 Baseball game that I decided in my head as an 8th grader that I could do it. This is what it took me to reach “success,” and you can inspire the same goals in your kid. Whether it’s going to the High School he’d go to, or the College you’d love him to go to, get him to see with his eyes and imagine himself there. Don’t Bring The Game Up On The Car Ride Home. No one likes that pushy salesman in life, and your kid doesn’t want it in his baseball career. No Instant Gratification. Parents of top athletes exhibit positive emotions with their kid(s). In baseball, that means highlighting the positive and forgetting the negative. In baseball those great days don’t come that often, and if they do, they probably haven’t started throwing your kid sliders yet. 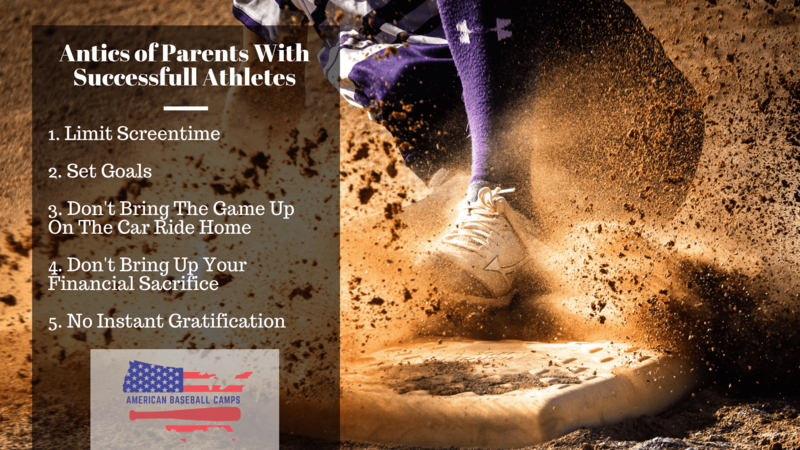 Confidence is the key, and there are many things that you can implement as a parent to achieve tremendous confidence in your ballplayer over time. How Maslow’s Hierarchy of Needs works, is that you have to solve the first layer before you can move on to the next, then the second before the third, and so on. So if you want your kid to increase in confidence let’s map out a plan to solve those bottom three layers. We already talked about playing as much baseball as possible this contributes to his physical and psychological needs as well. Now let’s look a litter deeper at getting your kid prepared from a physiological perspective. Brian Cain one of the worlds’ leading baseball psychologists recommends 9 hours and 15 minutes of sleep every night – not just the nights of competition. Studies show that increased sleep relates to better reaction times, more accurate reactions, and better able to handle stress. Studies also show that its not only the length of sleep but the quality of sleep that leads to better athletic performance. Did you know that the blue light emitted from that screen that your kid is staring at for 6.5 hours per day watching YouTube videos could be ruining his quality of sleep and in turn his baseball performance? It does, and it is, and it needs to be reduced if you want this layer of the period to be met. With regards to nutrition: studies say that an ounce of water for every pound of weight for people and then about 1.5 for every pound for athletes. Remove sugary drinks and add more water and you are off to a great start in helping him gain confidence. His mood will be better, skin, sleep, everything. The game has changed, you can’t coach kids like you as a parent were coached. Negative reinforcement has officially been trumped by positive reinforcement. If you want more on this from a big-time coach -> Listen to Head Coach Chad Holbrook of the University of South Carolina talk about safety and positive talk while playing. How would you feel if your kid came into your workplace and was shouting at you telling you what to do as you were trying to do your job? Would you produce? Probably not. This is an exaggerated example, but I believe it accurately describes how difficult it is to hit a baseball when you can hear your dad or mom shouting instructions from the stands. Cut it out, and allow your kid to play. As noted earlier, don’t talk about the game on the drive home. Your kid needs to feel that he is loved and that he belongs in your family apart from his baseball success. It’s hard to believe that this is a big confidence factor but it absolutely is. One of my best friends had a dad that only loved his son when he was playing baseball and playing well and I’m telling you from first-hand experience that it is a confidence destroyer. Love on your ballplayer, regardless of the results. You are doing your part already by getting him to the 100 games a year, making sure he sleeps and eats right, and that your talk is positive. Now make him feel like you love him and that he belongs despite his success on the field. It’s hard to believe but many parents send this message of “we love you, but we love and praise you if you win.” It’s awful, get rid of it. Take care of his physiological needs first. Research says that parents of elite athletes limit screen time. We know that excess screentime can limit sleep and quality of sleep, we know that limiting screentime is easier said than done but trust us – it’s a great start. On top of that, replace water with tons of sugary drinks and you should be good to go for this one. Safety through positive talk. Be steadfast as a baseball parent! Kids will perform better if you can act as a positive safety net in a very tough game. Let him know that his success, and the way you treat and love him, are not related. Many parents have a tough time separating their kid’s success on the field from how they treat him, don’t do it, it’s only going to make the problem worse! Thanks for reading! 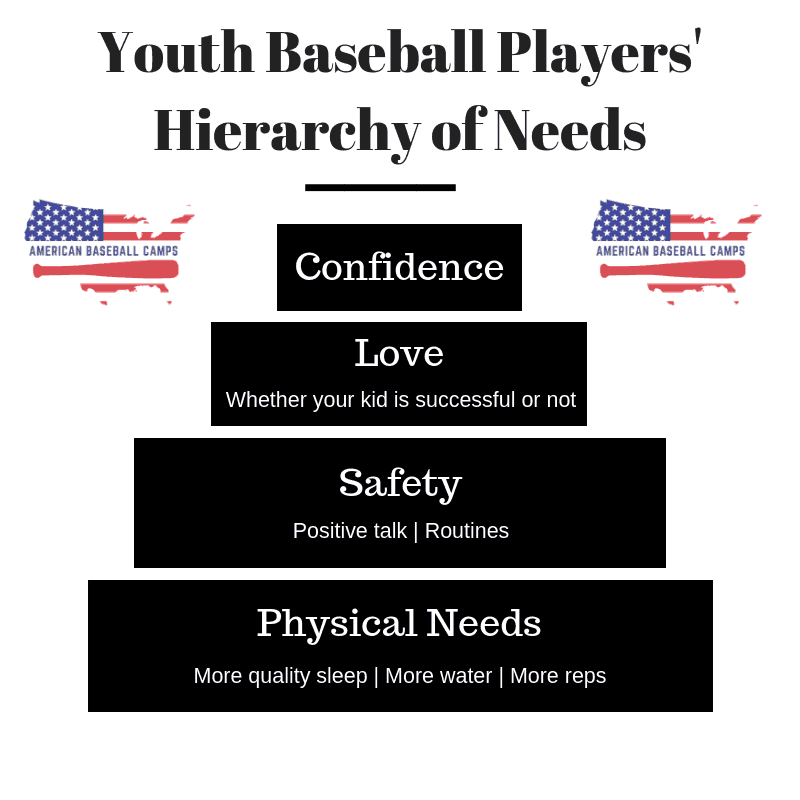 If you need any youth baseball advice we are always available to help at americanbaseballcamps@gmail.com, and we’ll do our best to respond quickly. If your kid wants more baseball – we’ve got great low-cost camp options in many US cities. For Winter 2018 we have camps from Wichita KS to West Covina CA. Next summer we will have camps in many US Cities –> All camp registration is done online, you can find out more about our camps on our camps page. 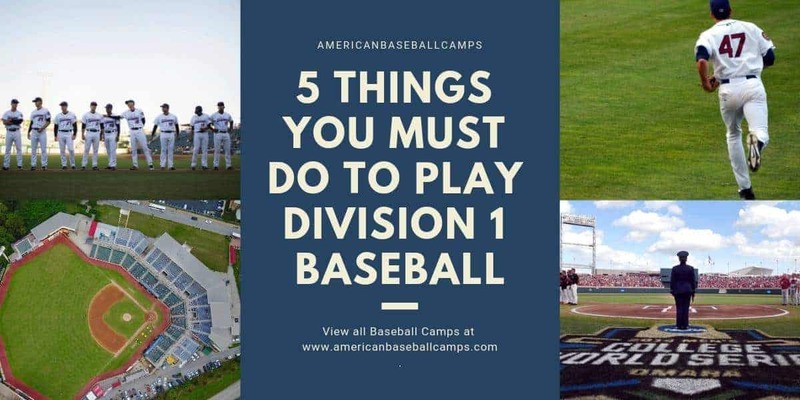 This blog was written by Nick Rotola of the American Baseball Camps team. Nick owns and operates Harvest Marketing Company, a digital marketing company offering Website, SEO, Google & Facebook Ad services. In D1 Baseball we learn about the importance of self-talk and how it can translate into better success on the field. This is something I wish I would have known when I was growing up in youth sports. Self talk is so important — Don’t beat yourself up when you make a mistake. It is important in self-esteem building to not compare yourself to others in baseball! So many of the complaints we hear from baseball parents have something to do with some other player on their team and “special treatment.” Jealousy and comparisons with teammates are not healthy thought to be going through a youth baseball players’ head. Parents don’t compare your kid to others on the team. A great way to encourage in youth baseball is with the good old-fashioned bribe. Coaches and parents, pick up a pack of helmet stickers at a local sporting goods store for around $5-10. With these stickers you can interchange hits or home runs with numbers on the back of his helmet. This way you can encourage his success while incentivizing him to be successful. After all, it is just a game. A game that is much more fun when you are encouraged along the way! There are two types of coaches out there, the one that encourages, and the one that screams at kids because he’s stuck in 1997 when he played. Seek out those coaches that are knowledgeable enough to know that kids play the best when they have high self-esteem and believe in themselves. Find coaches that cultivate that kind of mindset at the baseball field. 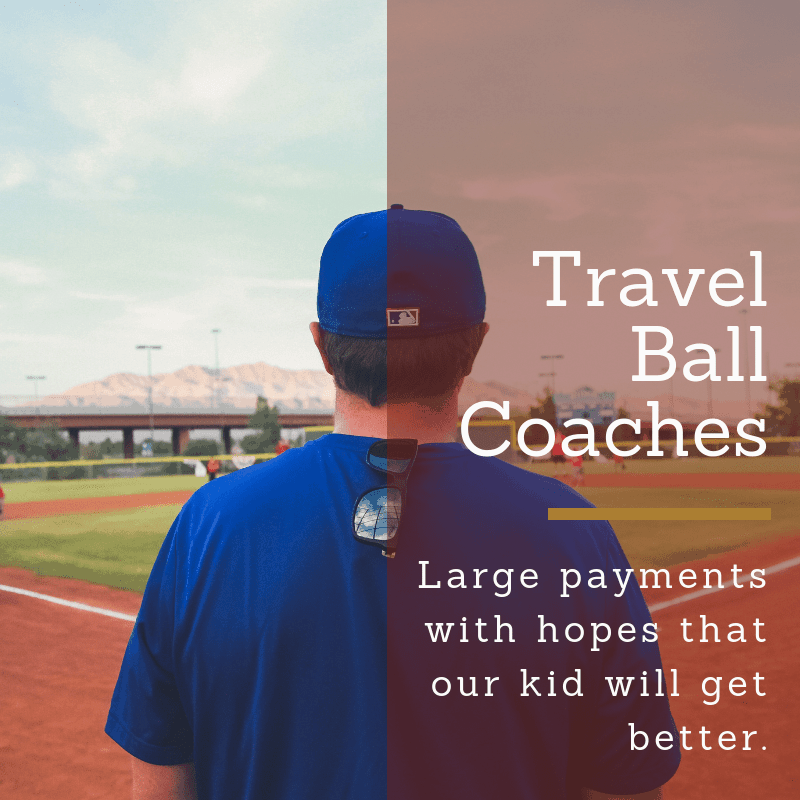 Baseball is expensive, put more of your money into tournaments and camps that will make your kid better and less into gear with these savvy baseball shopping tips. 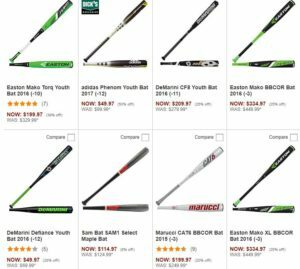 The first one, the Easton Mako Torq for $199, that bat was $399 at one point. I’m telling you buy them clearance. *Here’s another tip* – The college guys, we get to test these new bats, we velocity test them, bat speed, the whole nine yards. What do we learn? THERE IS NOTHING BETTER ABOUT THE BRAND NEW MODEL. In fact, many of the 3 year old bats have more pop because they’re broken in. 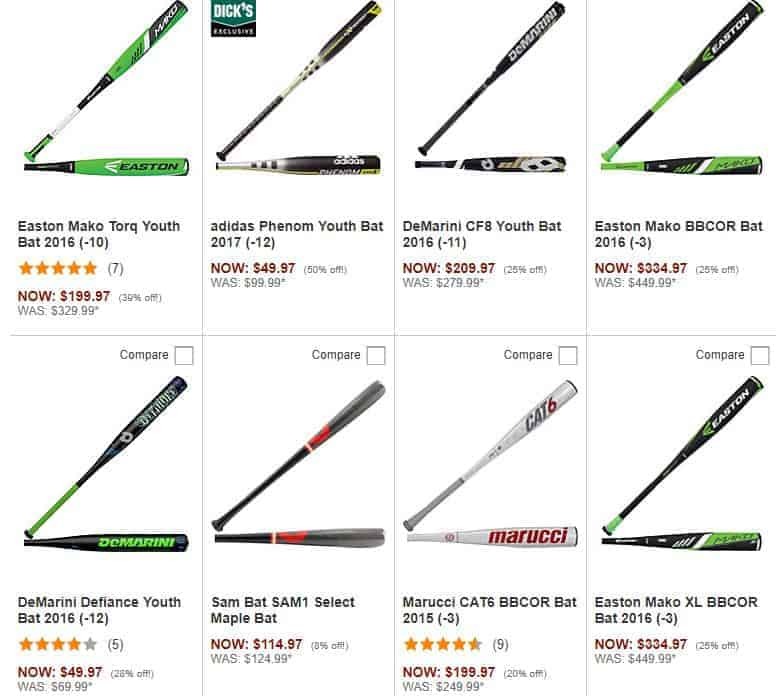 If you watch the CWS (which is the best players in the world still swinging medal bats), many of them are using models from 2 and 3 years ago. They aren’t improving year to year, just new branding. So buy one that’s a couple years older, and let him use it for a couple of years so it fully breaks in. First of all, don’t get your kid a new glove if he’s comfortable with the one he’s got right now. There’s a famous story about Dustin Pedroia (2nd Baseman for the Red Sox) when he was at Arizona State. Glove company Wilson came in and gave everyone on the team a brand new glove with their name on it and everything with only one stipulation, you had to wear it in games. Dustin wouldn’t do it. He was ASU’s starting SS and he had been using the same glove since he was 11 years old. ASU’s glove contract with Wilson survived, but it tells us something interesting about gloves. YOU DON’T HAVE TO BUY ONE EVERY YEAR. 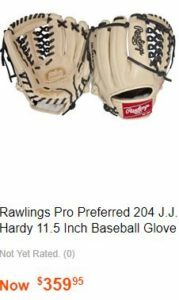 In fact, if you look at the best fielders on your kids’ team, they’re probably all using gloves they feel really comfortable with. Comfort is everything with gloves. Most of the time that means finding one that you like, and sticking with it for a long time. Below we have selected a cheap an expensive glove option from Baseball Savings. I think they’ll both work great and hopefully your kid sticks with them for 4 or 5 years. After the 2 year mark is when you really fall in love with a glove. If you notice, both of these gloves are Rawlings. We think its the best leather, and if you look at the big league infielders, most of them use Rawlings. The big difference between these two great gloves is the leather. 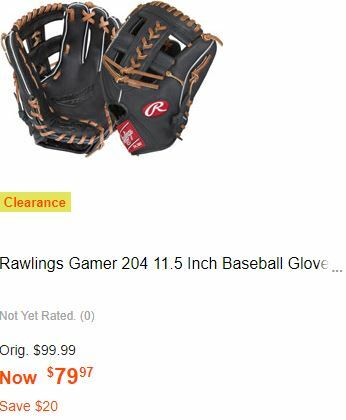 The cheap option here is a nice “I-Web” glove that is going to be good for a long time. The expensive option here is the “Pro Preferred” model and its a “Trapeze-Web”. This is one of the most famous shortstop gloves of all time. A lot of pros like this glove. Both of these gloves are 11.5 inch which is for a shortstop or second baseman. Third baseman traditionally use an 11.75 inch glove, and outfielders a 12.75 inch glove. 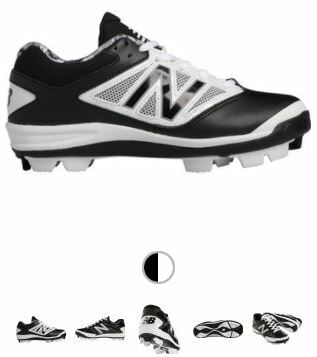 Many of the College teams are switching over to New Balance cleats because the players are asking for them. These things are crazy comfortable and they last a long time. Cleats may be something you have to buy every year depending on your kids’ playing style, but these have the best chance to last you 2 or 3 years. Here is a screenshot of a good, low, molded cleat. These recommendation were based on several hours of research and years of experience at the D1 level. Confidence. Confidence. Confidence. Many talk about how important it is in youth baseball, but few youth baseball players have it! We lay out in this brief blog a few simple things to instill in your kid to give him tremendous confidence at the plate. Sometimes the smallest mental adjustments can make the biggest difference in youth baseball. When a kid is hitting well he usually continues to build confidence as he does so. This is why you should reminisce about great at-bats. Remembering yourself being successful can be a great tool as you are on the on-deck circle. This is one of the best ways to quickly build a kid’s confidence, just remind him of his last great at-bat. On the contrary, bad at-bats can do the same for a kid negatively. Those are the at-bats you’ll have to encourage him to forget about. That is such an important thing to teach your kid about his at-bats; remember the good ones, and forget the bad ones. Confidence is something that a kid can control if he really wanted to. One of the best ways to get him to feel that feeling of confidence is to teach him to walk with it. Have him grab the barrel of the bat and walk to the plate like he’s got the biggest chest on the field. It is scientifically proven that good posture can boost confidence and that being confident can boost confidence. 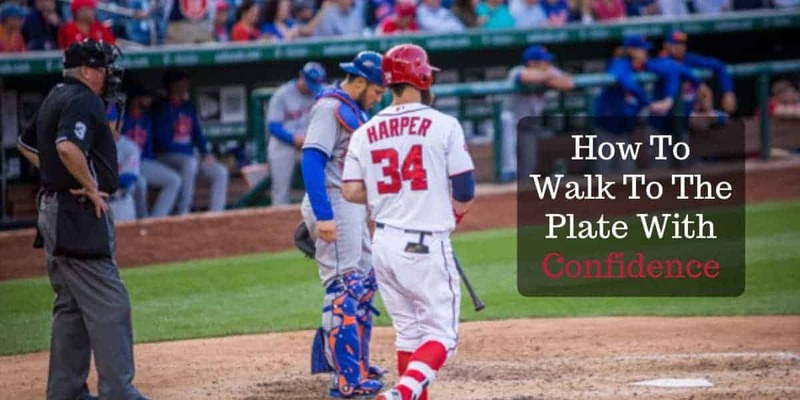 Have him do both every time he walks to the plate and we guarantee you he’ll hit better! No matter how small or skinny your youth baseball player is, you can teach him to be fearless at the plate. There is no reason you should ever give the opposing pitcher any credit when talking to your son. If your kid is 8, let him know that he can hit any 8-year old in the country. Look at the worst kids in youth sports, they probably all have one thing in common, fear. Fear can kill a young ballplayers mindset and it should be avoided at all costs. Speak positive things to your young ballplayer, and never give an opposing pitcher too much credit, your kid can hit him if he’s fearless I promise! You’ve seen all the big league guys, they do the same things and they have the same rituals every time they step into the batters box. There is a reason they do this, it builds confidence and adds a level of consistency and comfort. Baseball players play the best and hit the best when things feel routine. Nothing is more routine than doing the same thing every time you step into the box. 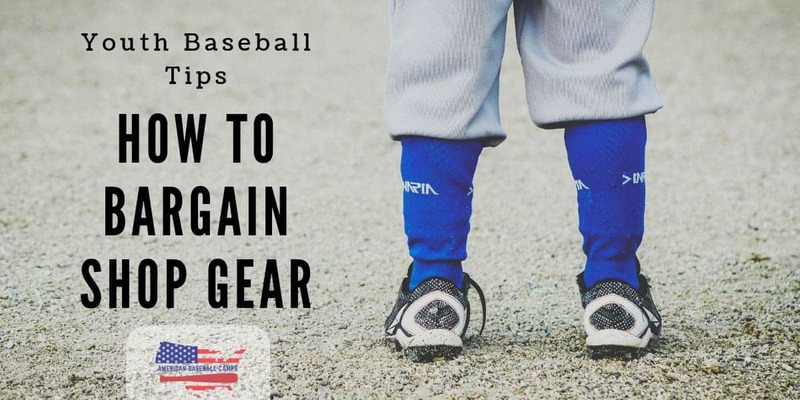 So whether your kids’ thing is to spit on his batting gloves or dig into the back corner of the box, encourage him to do the same thing every time. When things become routine, they become easier. What that means is that eventually it can feel like your kid has done it before and the brain tricks the muscles into feeling like they can do it easily. I remember sitting on the bench before an at-bat, visualizing myself hitting a double in the gap, and then going out there and doing it first pitch. I’ll tell you what, visualizing success in baseball works! I wish I would have known about it when I was 10 or so like many of your kids! I was working on hitting with a 6 year old kid the other day. Just as a favor, one of our family friends asked me to work with her boy. This kid plays t-ball in Oklahoma and is a pretty good little player. But as I was tossing the ball to him he kept swinging and missing. He said with the utmost confidence “I can’t do it”, even though he ended up foul tipping it, and then connecting with one a few tosses later. It occurred to me that this particular kid, who is a pretty good player, had never attempted to hit a baseball that wasn’t on a tee! In fact, I’m not so sure he had ever practiced outside of baseball practice. This is what we are going to call the under-prepared player, and he is placed in a severe disadvantage. On my circuit around the state talking with Youth Baseball Coaches about American Baseball Camps, I overheard a certain coach talking to his 7U team. He was cancelling practice for the next day because he didn’t want the kids to get sick with the cold-front (the forecast was 60 degrees). This encounter helped me realize that the X FACTOR in youth baseball is getting better outside of organized baseball. You cannot rely on your 9 year old kid’s coach to develop him fully as a player. My friends’ kid practices maybe once or twice before the season, and then plays one game a week. 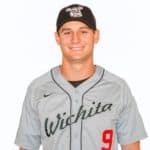 I’m telling you, if your kid is only playing baseball when he has his uniform on, and mom is taking pictures, he is going to have a tough time being great. The difference in baseball environments between myself and the aforementioned 6 year old is what I believe to be the X FACTOR in Youth Baseball. It is what can set your kid apart from the pack. To demonstrate this further lets take two kids and you decide which one will be the dominant player on his team. Signs up for t-ball and is excited for his first practice. Practices a couple times before his first game and spends approximately 1.5 hours a week playing. Signs up for t-ball with a comprehensive understanding of the game and how it works. Including an understanding of the force out rule. Practices almost if-not everyday with friends or family in the backyard with a bat and a ball, or a broomstick and a tennis ball, anything they can get their hands on. What I am saying is not that player #1 will never be successful, or that parents need to drill their kid to be like player #2. My point is that baseball is a sport that requires “reps.” Why do division 1 shortstops take 100 ground balls a day? Because it makes it so easy by the time they get one in the game that it becomes routine. It takes practice to become a great baseball player, you can’t just show up and rely on athleticism. Baseball is a beautiful sport because it is proven that a kid that gets more reps outside of baseball will be better than a more athletic kid that doesn’t understand or practice the game. You can’t make a kid love a sport, and you don’t want to be that baseball parent that is resented for trying to force work-ethic. But you can certainly help cultivate a baseball environment at home. Your kid will never be great if he is only doing baseball things at the field twice a week, with a practice every other. The kids that have a passion for the game have been and always will be the best. That is the X FACTOR in youth baseball, getting extra baseball reps outside of baseball practice/games.